Watch out, Samsung fans! The new Samsung Galaxy S10 may be dropping into the market as early as February 2019, and it looks like this particular model underwent a serious overhaul. The Galaxy S10 will come in three versions, and details about the most basic version have just been leaked. 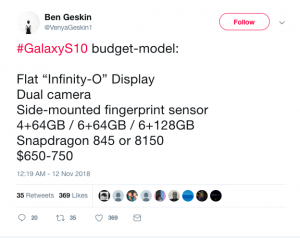 Concept artist Ben Geskin, who leaked the details on Twitter, said that it will have a “Flat ‘Infinity-O’ Display, Dual camera, Side-mounted fingerprint sensor , 4+64GB / 6+64GB / 6+128GB (storage), Snapdragon 845 or Exynos 8150 (chipset)” and will cost between $650-750 (S$ 894-1032). In comparison, last year’s S9 cost US $720 (S$ 991). To explain further, Geskin meant that the three storage options of the Galaxy S10 are as follows, one with 4GB of RAM and 64GB of storage, one with 6GB of RAM and 64GB of storage, and one with 6GB of RAM and 128GB of storage. It’s also possible that the foldable Samsung Galaxy S may be launched at the same time as the Galaxy S10, and perhaps be made available the following month, in March, with a 5G version of the S10. But price-wise, the folding phone will likely cost more than a pretty penny, with industry experts estimating the cost to be around US $1800, or almost S$ 2500. For the design and display: Three different screen sizes, A bezel-free and notch-free design, A 19:9 aspect ratio and 1440 x 3040 resolution.